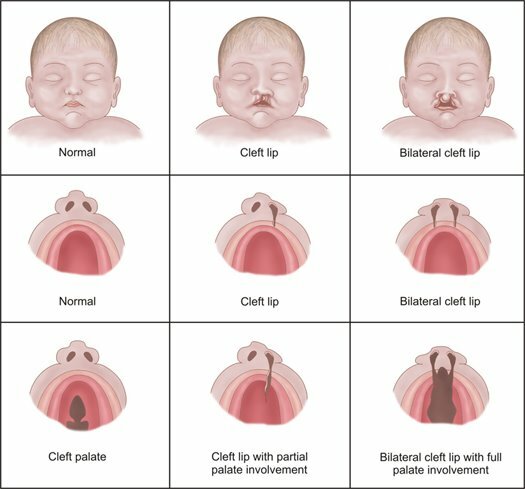 Orofacial clefts are congenital malformations characterized by incomplete formation of structures separating the nasal and oral cavities: lip, alveolus, hard and soft palate. The average incidence of CLP is 1-2 per 1000 live births. Epidemiological studies in Italy has demonstrated that cleft palate as well as right sided clefts are more frequent in females, while left sided clefts are more frequent in males. Carinci F, Rullo R, Farina A, Morano D, Festa VM, Mazzarella N, Del Viscovo D, Carls PF, Becchetti A, Gombos F. , Non-syndromic orofacial clefts in Southern Italy: pattern analysis according to gender, history of maternal smoking, folic acid intake and familial diabetes. J Craniomaxillofac Surg. 2005 Apr;33(2):91-4. Orofacial clefts are usually identifiable at birth as an opening or split in the upper lip, the palate or both. After birth a physical examination of the mouth, nose, and palate confirms a cleft lip or cleft palate. Oral cleft is a defect of formation of the frontonasal proces by wich nose, superior lip, maxilla and primary palate take origin, or is a defect of the fusion of the frontonasal proces with the two maxillary processes. These two anomalies are caused by defects of neural tube. The pathogenesis of cleft lip and cleft palate is complex; the most widely accepted model is the multifactorial inheritance (Carter, 1969;Fraser, 1970), according to wich this pathology is connected to the interaction of genetic and environmental factors.